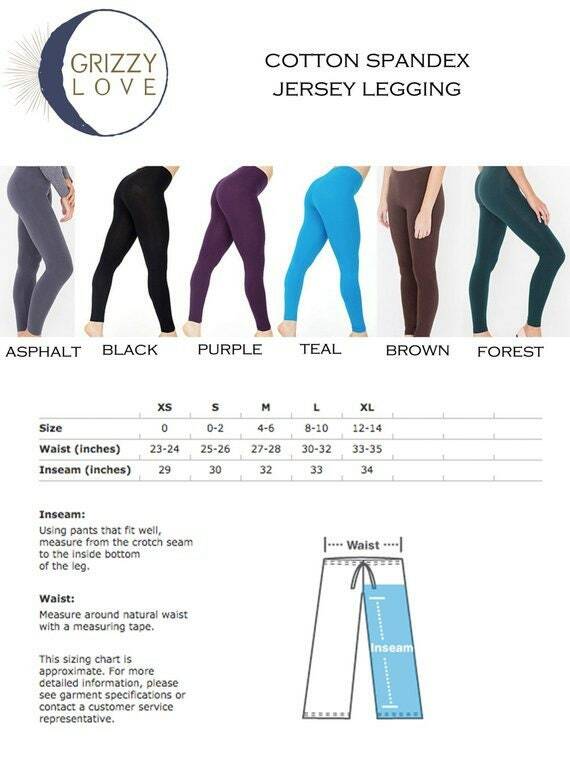 High Waist cotton spandex Jersey Leggings (95% Cotton / 5% Elastane construction, refer to last 2 photos to see the high waist band). Δ Cutty "SEAWEED" Design runs down the sides of both legs & Cosmic Honeycomb silk screen pattern runs throughout the leggings. ↠Regular Dyed Brown legging (hand dyed by us) with GLOW IN THE DARK cosmic honeycomb and gold Sri Yantra Totem print (shown in images). ↠Regular Solid Black legging with GLOW IN THE DARK cosmic honeycomb and gold Sri Yantra Totem print. ↠High Waist Dyed Brown legging (hand dyed by us) with GLOW IN THE DARK cosmic honeycomb and gold Sri Yantra Totem print (shown in images). ↠High Waist Solid Black legging with GLOW IN THE DARK cosmic honeycomb and gold Sri Yantra Totem print.